For most UK stock market investors, 2018 was not a year to celebrate. The FTSE 100 fell by 12% from 7,648 to 6,734, which left the large-cap index at levels first reached almost 20 years ago in 1999. The FTSE 250 faired even worse, suffering a 15% decline from 20,681 to 17,587. On top of that we’ve had a seemingly endless stream of fear-based highly negative ‘news’ from the financial and mainstream media. Most of this relates, of course, to the various dystopian futures which were may or may not be subjected to if Brexit ever actually takes place. In such a negative environment, is there any positive news we can cling to, if only to maintain our sanity? If that sounds like a load of gobbledegook, please allow me to explain. Although the FTSE 100’s price fell by 12% in 2018, its intrinsic value may have increased. Intrinsic value: The sum of all future cash returns from an investment, discounted (i.e. reduced) at an appropriate rate to take account of the time value of money. Time value of money: Time literally is money. For example, receiving £1,000 today is preferable to receiving £1,000 a year from now because if you £1,000 invested or saved today is likely to be worth more than £1,000 a year from now. Alternatively (and this is my preferred interpretation), £1,000 today is preferable to £1,000 a year from now because you may be dead a year from now. For the FTSE 100, you can replace the words ‘cash returns’ in the definition above with ‘dividends’. So the intrinsic value of the FTSE 100 today is the sum of all its future dividends, with those future dividends discounted at an appropriate rate to take account of the monetary value of time. In other words, falling share prices allow you to buy a bigger slice of each company (or the market as a whole) for each pound invested. More importantly, when shares and indices fall below their intrinsic value, the market is selling something for less than it’s worth. 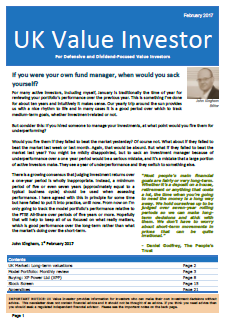 For long-term investors that is unequivocally a good thing, although your inner monkey may disagree. Note: If you’re a retired investor living off your dividends then falling share prices are neither good nor bad. But while falling share prices are no reason to celebrate, they’re no reason to panic either. Unfortunately it’s impossible to work out a precise figure for the FTSE 100’s intrinsic value. That’s because intrinsic value depends on future cash returns, and the future is ultimately unknowable. 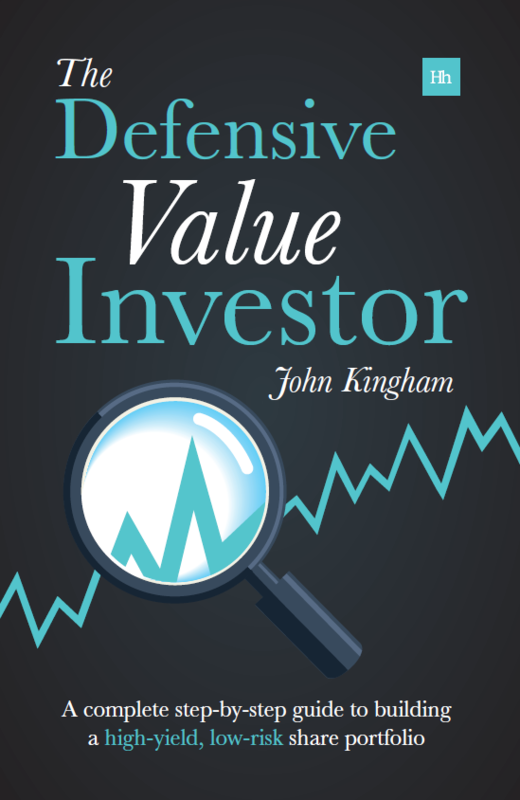 However, there are various ways to estimate intrinsic value, one of which is knows as the dividend discount model (or the Gordon Growth Model). 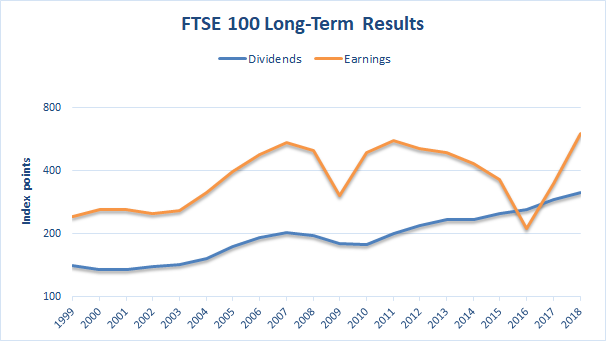 Since 1985, the FTSE 100’s dividend has grown by 6.1% per year, on average. On January 1st 2019, the FTSE 100 stood at 6,734 with a dividend yield of 4.68%. For example, if an investor buys the index with a 4% dividend yield and a 6% expected dividend growth rate, then we can assume that the investor’s desired rate of return is 10% per year. 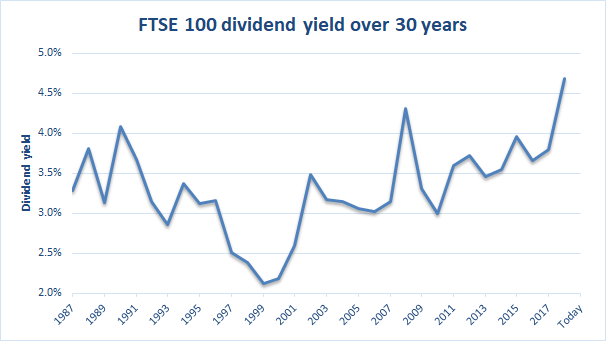 In reality, since 1985 the FTSE 100’s dividend yield has averaged 3.3%. And so, under a set of quite reasonable assumptions, the dividend discount model suggests that the FTSE 100’s intrinsic value is just over 10,000. That means the FTSE 100, at today’s price of 7,134, is trading at a discount of almost 30% to estimated intrinsic value. Can the FTSE 100’s intrinsic value really be as high as 10,000? Obviously I don’t have a crystal ball, but yes, I think the FTSE 100’s current intrinsic value could be as high as 10,000. Too many investors irrationally anchor their expectations of future prices to prices from the recent past. For example, the FTSE 100 has been range-bound (approximately) between 3,500 and 7,000 for more than 20 years. For entirely sensible reasons, we expect the future to look like the past (I expect fire to be hot because I have found fire to be hot in the past). But this doesn’t necessarily apply in the stock market. The 20-year period mentioned above started in 1999 with the FTSE 100 at 7,000 and with a dividend yield of just 2%. At that point, the index was massively overvalued and had an estimated intrinsic value (according to the above dividend discount model) of just 4,300. Today the FTSE 100 is still at 7,000 (7,134 at this exact moment) but the dividend yield is a much more interesting 4.4%. So the index’s price hasn’t grown for 20 years, but its dividend has more than doubled thanks to an increase in productive assets (property, plant, equipment, etc.) fuelled by retained and reinvested earnings. If investors today were as enthusiastic about the FTSE 100 as they were in 1999, its yield would be 2% and its price would be 16,700. In that context, 10,000 is really not that high, and investors should get used to the idea that the FTSE 100 could exceed 10,000 in the next few years (although there are no guarantees, of course). Forecasting the stock market over a one year period is a fools game, so this is just a bit of fun. Although it’s still educational fun because the forecast should be based on rational numbers and reasonable assumptions rather than irrational feelings and beliefs. The 50% mean reversion rule: The expected value for the price of an investment one year from now is that it will be halfway between the current price and the investment’s intrinsic value. In other words, the gap between price and value is expected to shrink by half each year. The year-end intrinsic value of 10,730 is 6% higher than the current intrinsic value estimate of 10,123 because of the expected 6% dividend growth in 2019. For the FTSE 100 to hit that forecast (which it obviously won’t hit exactly) it would need to go up by 25% from where it is today. Is a 25% gain in the FTSE 100 really possible in a single year? Yes, although it would be a bit of a stretch. So if these historic probabilities are even remotely reliable (which they sort of are), then the odds of the FTSE 100 reaching 8,900 in 2019 are about two in 34, which is not very good. However, the odds of it going up by 10% or more are about even, and that would leave it at slightly over 7,800. So although my theoretical forecast is for the FTSE 100 to reach 8,900 by the end of 2019, I think a more realistic forecast is 7,800. And while as a value investor I realise that lower prices are better for accumulating investors, it would be nice to see the FTSE 100 exceed that forecast slightly and finally break the 8,000 barrier, if only for psychological reasons. I always follow your articles, thanks for your contribution and ideas, they are very interesting! I see that you follow a statistical/mathematical approach in your analysis, but shouldn’t we add in potential woes due to Brexit in 2019? I am forecasting, like many, a lukewarm, if not mildly negative, 2019. It seems that the economy is slowing down and at the same time I see lots of potential “good news to sell” coming our way (the cited Brexit is one of those, but we have EU elections, Venezuela crisis, Asian level of consumption just to name a few). Yes, you are free to add in whatever macroeconomic assumptions you like! However, I have no idea what’s going to happen to the global or UK economy, so my assumption is that the more things change, the more they stay the same, and that historical growth rates are as good an estimate of what will happen over then next 10 to 50 years as anything else. And remember, these valuations and forecasts are taking account of long-term value and long-term cash flows, not short-term economic or political ups and downs. And the underlying assumption there is that whatever’s going on today will not seriously impact the economy in the long-term. Very much appreciate the work you do to help the private investor, thank you. Cannot get my head around the desired rate of return, if a yield of 4% grows by 6% it becomes 4.24% . The expected total return of 10 % is surely only available if the yield is 4% and the index – not the yield – grows by 6% . I note that the Gordon model refers to the desired growth but that would appear to be the Company (or Index) Growth. Are my underpants in a twist? The bit I always forget to point out is that the yield is assumed to stay the same. So if the dividend goes up by 6%, and if the yield stays the same, then the price will also go up by 6%. That gives us, in this example, a 4% income and a 6% capital gain, which equals a total return of 10%. So no, your underpants are not, as far as I can tell, in a twist. First of all, many thanks for the analysis, which is great. I too agree with you and continue to find buying the FTSE 100 attractive based on (a) low valuation (b) negative sentiment (c) other markets being higher rated. The FTSE 100 is one of the cheapest markets currently on a CAPE ratio as you no doubt know. I like the dividend yield but know enough to know its TSR that matters! Stalflare – Brexit would probably be a net +ve for the FTSE 100. Why because majority of earnings are dollar denominated so a falling currency is positive when translated back to pounds. For the FTSE 250 and UK economy probably a different outcome. So where could we be wrong…..
Well obviously a new government that nationalised 10% of a company wouldn’t be good now…..and I think part of that might be reflected in the price. Risk of a global recession is probably out there…. The one point that nags me though is the constitution of the index. When you compare historically do you not implicitly make the assumption that the quality of the index and therefore its outlook is the same (for better or worse) as it has ever been. Anyway…its good to challenge yourself and I feel more comfortable buying the FTSE 100 today than the S&P 500 – Full disclaimer – I own both! If you want to weight yourself slightly to the index the Vanguard Lifestrategy index fund is a nice way to do it simply. Overweights the UK. Hi Seekingfire, thanks, you’ve made some valid points there. The FTSE 100 is quite international, so how it reacts to Brexit depends to a large extent on what happens to the pound. As for the constitution of the index, I can’t really comment on whether its largest holdings today are better placed than those of 10, 20 or 30 years ago, but it does seem to be heavily skewed to a small number of companies. For example, Vanguard’s FTSE 100 tracker has 10% in Shell, 7% in HSBC, 5% in BP and 4% in GSK, AstraZeneca and Diageo. That’s about 35% of the index in just six companies and more than 10% in one oil & gas company. My model portfolio has 30 holdings and about 30% is invested in the largest six holdings, so by that measure it’s less concentrated than the FTSE 100! I can’t say whether this will positively or negatively affect the index’s returns, but it definitely makes it a surprisingly concentrated and therefore risky index, especially given the way most index investors think holding the FTSE 100 is a good way to diversify. Isn’t it a bit meaningless to assign value to future discounted cash flows without factoring in inflation assumptions? Not necessarily. Inflation doesn’t have a large or consistent impact on corporate growth rates, or returns on equity, so it can be ignored when discounting future cash flows. If we believe that inflation doesn’t seriously affect nominal returns, then inflation will have an impact on real returns, because real returns are nominal returns minus inflation. So if I’m assuming, say, 10.6% nominal returns from the FTSE 100 due to its dividend yield of 4.6% and estimated dividend growth rate of 6%, then the expected real rate of return is just 10.6% minus an inflation estimate. I tend to just use the Bank of England’s 2% target as the estimated future inflation rate, which would give a ‘central projection’ of 8.6% real annualised return for the FTSE 100 at its current price. Obviously we won’t get exactly that return, and it depends on the time-frame, but I think it’s a reasonable estimate of expected future returns. OK, I think I understand – inherent to this is the assumption that the inflation rate is stable. What threw me was your selection of 1987 as the starting point. If you had been selecting a low inflationary era (from 1997 for example), I think this is arguable. Does basing your analysis of ‘norms’ including a period of high inflation distort the outcome? If you look at the nominal UK and US dividend growth rates over the last 100 years (via Robert Shiller’s spreadsheet, or the Barclay’s Equity Gilt Study, or the Credit Suisse Global Investment Returns Yearbook) they tend to be around 5% per year, on average, obviously with a lot of volatility in the growth rate too. There is some relationship between inflation and dividend growth, but which is cause and which is effect I have no idea. I.e. do dividends go up faster in booms because the economy is booming and the boom creates inflation, or does inflation drive up dividends? Probably a bit of both. Buffett thinks earnings (and hence dividend) growth is largely independent of inflation, although the returns of the German stock market during its period of hyperinflation suggest otherwise (although I have only seen data on stock prices, not earnings or dividends). I think the relationship between inflation, earnings and dividends is probably weak enough and unpredictable enough so that we can reasonably ignore it and just use historic norms for expected dividend growth. I’ve used 6%, but 5% would be another entirely reasonable assumption. If you expect inflation to run at say 10% then you could assume 10% or 15% annual dividend growth, but I don’t think there’s much data to suggest the relationship is that strong. If you look at the US data for the 20th century there are periods of high nominal dividend growth when inflation is low (e.g. today) and periods of medium nominal dividend growth when inflation is high (e.g. around World War One), and everything else between. So I’m not sure there’s much value in forecasting inflation or real returns other than to say that high inflation is generally bad for a lot of reasons. – The sentiment of the crowd – how Mr Market will be feeling at that future date , reflected in the multiple he assigns those earnings at that point. the first one is very hard, the second is impossible. No coincidence that hardly anyone gets any forecasts right. The FTSE100 is a low growth, inferior collection of businesses dominated by Financials, pharma and Oil and Gas ( taken as a group the previous five year earnings growth rate is 0% p.a in a situation where that has been no recession). ROE is low, growth is low and hardly any earnings are retained to create value. So it is cheap but it is cheap for a reason – you are getting an inferior product for a lower price. Not sure how a group of businesses that is not growing earnings at all is going to increase dividends from. Ironically the FTSE 100 is unique in that it is a collection of international businesses but its value if calculated in sterling. So the value of the FTSE could simply increase solely because the sterling falls even if the underlying business earnings do not change. And vice versa. Currency rates, however , are also impossible to predict. Hi Lemsip, of course you’re entirely right in that it’s impossible to forecast or predict what the market’s going to do. That’s why I said “Forecasting the stock market over a one year period is a fools game, so this is just a bit of fun”. However, I disagree with your statement that the FTSE 100 is a ‘low growth, inferior collection of businesses’. In recent years the index’s dividend has continued to grow at an average of around 5% per year, which is more or less in line with historic and international norms. And while earnings haven’t grown much over the last five years, and even since the pre-crisis peak of 2007, earnings are too volatile over such a short period to draw any long-term conclusions. I would say let’s wait and see where the index’s earnings and dividends are five or ten years from now. As for currency movements, they are impossible to predict so I assume they stay fixed (i.e. I ignore currency as a driver of returns), which is a reasonable assumption I think and certainly makes my life easier. Well dividend’s don’t come out of thin air. if earnings are not growing, dividend growth can only come from businesses stripping value out. To your point about the long term, well the FTSE 100’s record tells a story. Over 2 decades ( which is long enough to draw a conclusion) , the FTSE 100 has only grown its capital value by 23% – measured in a currency that has massively depreciated in the same 2 decades so the record is even worse. Over those 2 decades it has continued to pay rising dividends but those dividends have a significant opportunity cost. So looking at dividends alone leads into traps of this sort. It is no surprise given the nature of the businesses and the investing culture in the UK being dominated by pursuing “income” . Well i can put money in the bank and keep paying myself a rising income, till the point it runs out and someone who only saw the monthly flow would assume it is a great investment. I personally wouldn’t touch the FTSE 100 with a barge pole but obviously anything could happen if the crowd turns enthusiastic about energy, pharma etc and/or the sterling tanks. I also agree that the quality of the index is not as good as some other indices. That’s why you should never have all your assets in one market! Essentially the FTSE100 has gone sideways since 1999 and you would have been better putting your money into a bank account on a total return basis and also a risk adjusted basis. But….it is one of the cheapest developed index around now because of that. The CAPE ratio positions the FTSE 100 as half as expensive as the S&P 500. Where else could we be wrong. the other point I guess is on dividend pay-out ratio. A high dividend pay-out ratio leaves less earnings to reinvest. And the FTSE 100 has a higher dividend pay-out ratio than the FTSE 250 or the S&P 500 for ex. I suspect that future dividend growth will not be as high as historically has been the case. But I think that’s factored into the price. Hi SeekingFire, yes the FTSE 100 is far from an ideal index, especially as a single investment for a passive investor. A long time ago in a galaxy far far away I used to have all my money in a FTSE All-Share tracker. The dot-com crash showed me what a bad idea that was. So now any passive investments I manage (primarily a JISA for my son) are in some sort of global stock/bond trackers, e.g. Vanguard LifeStrategy 80/20. Even mega-cap companies like Apple don’t make up more than a percent or so of that sort of tracker, so diversification is much broader (although there’s still some concentration in big tech companies). As for everything else you said, I pretty much agree. FTSE 100 = low CAPE, possibly lower future dividend growth (but who really knows?) and dubious dividend cover. But as a simple forecasting method, I still like the normal dividend growth plus normal yield approach. Also, CAPE-based forecasts (e.g. assuming mean reversion to historic CAPE valuation norms, say 16) give a lower estimate of ‘fair value’; somewhere in the mid-to-high 7,000s, so saying fair value is between about 7,000 and 10,000 is probably reasonable. Do you have any up-to-date data on the forecast dividend cover for the FTSE-100? BP and Shell have produced some very strong results recently and given their dominance this may not be picked up by trailing measures. Hi Jon, sorry I don’t have forecast data for the FTSE 100. I extract dividend and earnings data (and therefore dividend cover) from historic data published by the FT.
No problem, thanks for the reply. My guess is that the cover will increase nicely due to the oil price recovery feeding through into earnings for Shell and BP. Time will tell! Impressive analysis I must say. The FTSE100 and its current dividend yield looks very attractive to me. The drawback is that it pays dividends annually, at least on my Vanguard account, which could reduce the compounding effect over the long run? What are your thoughts on how the FTSE would be affected under a future devaluation of the Pound Sterling? Would it be positive for UK companies, on the same way as it is for US based ones? I’m a big fan of value investing, but I still have little knowledge. Most of the resources focus on the American market, where is very difficult to find good undervalued business. Some say it’s an old approach that doesn’t work anymore due to the new efficient market theory. However, when looking into UK companies, there seems to be good opportunities, including The FTSE as you’re showing us. Your blog is very helpful for learning purposes, thank you John, it’s much appreciated. The FTSE 100 generates about 70% of its revenues from overseas, so devaluation of the pound should lead to higher revenues, earnings and values, at least in sterling terms. Value investing will never become outdated because the market isn’t efficient, because humans aren’t efficient (what a boring world it would be if they were!). However, that doesn’t mean it’s easy, because it isn’t (as I’ve learned over many years!). We have a similar ambition, but there’s a big difference, you know what you’re doing while I am still trying to figure it out 🙂 I am hoping that my blog and reading and interacting with others online will help me to change that. I’m keeping your book in my Amazon wish list, looking forward to reading it and get a different non-American perspective.